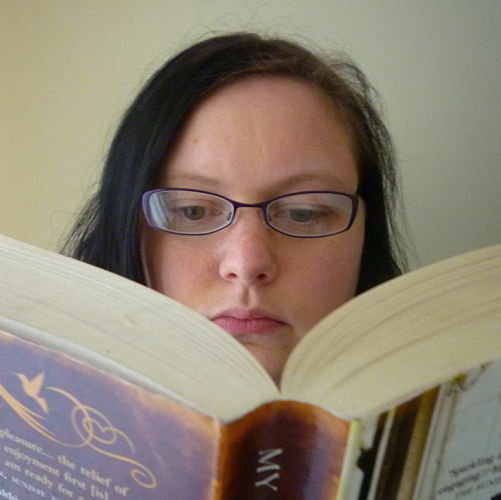 Angeline is a creative writer and journalist from rural Devon, England and has been a keen reader her entire life. She is rarely seen without a book in her hands and has been known to miss her bus stop because she's too engrossed in a novel. Angeline: I have always loved fantasy books, and read all of the Chronicles of Narnia series in just 10 days. I love fantasy books for their complete escapism and their freedom to break the rules of our world. I enjoy seeking out fantasy novels that are not what you expect, books that break away from the traditional 'high fantasy' with wizards and elves. I like to be surprised and have my imagination stretched. Angeline: I'd love to have more time to read, but I currently get through a book about every 3 weeks. I read on the bus to and from work and in the few minutes I'm waiting for the bus. I've been known to read while walking down the street too. Angeline: The last book I finished was 'Room' by Emma Donoghue. It has hit all the best seller lists and has been recommended by everyone. I was intrigued, as a writer, to see how she approached writing in 1st person present tense; an unusual and challenging choice. The book was so much better than I could have hoped; the story is told from the point of view of a 5 year old boy living captive within a single room with his Mother and offers a unique and intriguing understanding of the world. I would recommend this book to everyone. Angeline: I've just started reading some trilogies and often find that writers put in too much backstory in the subsequent novels. They have to strike a fine balance between not boring the readers who are reading the whole trilogy in order and not confusing readers who have just picked up the 2nd or 3rd book, and I don't think every writer gets that balance quite right. Angeline: Philippa Gregory: writer of historical fiction; she made me fall in love with the Tudor period and, in fact, historical fiction itself. Jeanette Winterson: a postmodern writer; I learned a lot about characterisation from reading her work. Sarah Waters: writer of gothic novels; she is an absolute master at creating atmosphere. Trudi Canavan: fantasy writer; just pure and compelling fantasy. Kristin Cashore: fantasy writer; she writes the same characters as I do - strong, independent, feisty women. It's interesting that I've chosen five female writers; I didn't set out with that intention; that's just the way it turned out. Angeline: I often end up on a total rant when it comes to e-books. I always say I will only ever buy an e-book reader the day they make one that smells like a book. People say they're handy in that you can have hundreds, or thousands of books that only take up the space of one book, but I love seeing all the books I've enjoyed on my bookshelf. I need the smell and feel of a book. I am not sold on the whole e-book thing at all, I would miss browsing bookshops way too much. Angeline: Write characters I can care about. There's nothing worse than a character that you can't empathise with, or feel anything for, even if they have a fantastic storyline to go with them. I love characters I can cry over, characters I can despise or be repulsed by, characters that have me shouting advice to them out loud. Angeline: I have poetry and short stories published, but am yet to complete my first novel. I have the first draft of my fantasy novel 'Ladies of Evertower' written; I wrote it during National Novel Writing Month (NaNoWriMo) November 2009 and hope to be up to at least draft number 3 by the end of the summer. Watch this space...! Angeline: As well as reading and writing, I love movies. I've recently got into a habit of reading a book and then watching the film adaptation (The Piano, The Boy in the Striped Pyjamas, The Reader, The Road and, of course, the Narnia books). I think directors are getting much better at creating a film adaptation that's sympathetic to the book. Once upon a time, the movie always ruined the book, but I don't think that's the case so much anymore. I have also recently joined a roller derby team and am enjoying being back on roller skates again after my childhood. Angeline: Mostly I read on the bus, but when I want to indulge, I'll curl up on the sofa under a blanket with a cup of coffee and my cat asleep on my lap. Angeline: I don't tend to eat when I'm reading; I'm pretty clumsy and fear covering my books in greasy fingerprints or spilling food over the pages! Angeline: I'm not much of a cryer when it comes to books, but there are two that have made me cry. The first was Angel Rock by Darren Williams; the story of two brothers who get lost in a forest and then, several days later, one of them returns, confused and distressed. The other that made me cry was The Lovely Bones by Alice Sebold. I was in tears by the second chapter of that one. I cried my eyes out at the film adaptation of The Reader because I had already read the book and felt closer to the characters than I would have from just watching the film. Angeline: I'm always laughing out loud at books. I think the funniest I've ever read, which had me in tears of laughter, was Saving Grace by Tom McGregor. The book is actually based on the screenplay rather than the other way around, but the book is miles better. Absolutely hilarious. Sadly, my copy was lost in the post when I sent it to my sister when she was living in Africa. I really must get my hands on another copy. Angeline: I'm currently halfway through My Last Duchess by Daisy Goodwin and loving it. After that, I have another trilogy by Trudi Canavan to read and I'm also on the lookout for a copy of Mary Shelley's Frankenstein. I've recently participated in the blogfest Favourite Book Challenge where people recommend their five favourite books, and several people listed Suzanne Collins' The Hunger Games, so I think I'll get myself a copy of that too. Angeline: Just keep reading, keep recommending books, keep talking about books. Storytelling is one of the greatest gifts we have, and it's so important to keep the reading community alive, so support your local bookshops and your local libraries. And always remember that reading isn't a solitary hobby, it's can actually be a very social one. Hey Deirdra, thanks for letting me take over your blog today. I had great fun answering your questions and it really is lovely to be here in your storybook world! I just bought an e-reader (the Nook touch screen) and I view it as another way to read. I still have a pile of at least 10 unread hard copy books I've bought the past few months that I will read, and if I go to a book event with an author, I'll probably still buy the hard copy. I don't think it has to be either/or. On the ebook side, I found an author online who just released a book and the ebook was under $7. I bought it a day after I heard of it and finished it 2 days later. I love the option of keeping up with new books, which I haven't been able to do before ebooks. But I'm not giving up on bookstores just yet. I also love the smell of books and the ability to browse the aisles. I'm sure I'll have an ereader one day, and I'm sure I'll absolutely adore it, but yes, like you, I'll never give up on hardcopy books entirely. There's nothing nicer than looking at my shelves packed full of all the books I've loved!